Whilst working in the Early Childhood Unit at the National Children’s Bureau (NCB) and being a visual artist, I have hugely enjoyed overseeing the ‘Making it REAL’ (Raising Early Achievement in Literacy) project in my role as programme manager for the last couple of years. There is so much to share in terms of how the REAL approach can help families to support their children’s learning through creative everyday activities. My experience as an artist also helps me to tap into thinking about the value of creativity in the context of family literacy work, and why it’s such an essential ingredient to making a project relevant and engaging for families. As an artist, I see a parallel between being an artist and being an early years practitioner– for both, the role is to enable exploration, experimentation, give permission to make mistakes and take risks, and to listen and respond, rather than to present all the answers. Essentially, it’s all about play, and enabling learning through play. By developing these creative characteristics of learning, both with young children and their parents and carers, a love of learning can blossom in the home, and the early years setting, and in fact everywhere in between. The REAL approach was developed by Cathy Nutbrown and Peter Hannon from the University of Sheffield and focuses on handing over knowledge directly to parents about how to support their children's early literacy development across four strands: oral language, books, mark making and environmental print (for example noticing text all around us, on shop fronts outside and packaging in the home). REAL is not just about early reading and writing, it presents literacy in the round with a focus on speech and language and cognitive development. REAL is very practical and embraces a limitless range of creative processes in order to inspire and develop early literacy with the whole family through a series of home visits and group literacy events; for example using homemade play dough to explore letters and shapes, writing shopping lists and going shopping, making props to accompany children’s favourite story books, songs and rhymes, co-creating environmental print scrapbooks and hosting mark making parties inside and outside of the early years setting for all the families to attend. REAL encourages practitioners to think creatively and to provide engaging activities that respond to individual child’s interests to make them as relevant as possible. 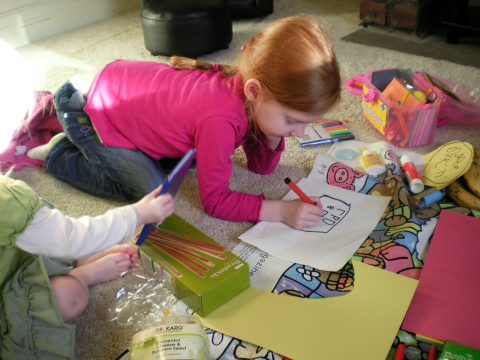 In the REAL project, writing packs for children are provided to families via home visits. The packs contain paper, a variety of pens, pencils and rubbers, a pencil sharpener, envelops, scissors and glue and are designed to encourage drawing and mark making. “Yasir was very excited and couldn’t wait to open the pack. He immediately took out the crayons and paper and drew a picture of his baby brother. I wrote ‘baby’ next to the picture and he made some marks. Dad and I talked about the similarities between the English and Somali alphabets and Mum wrote a shopping list. They encouraged Yasir to help and he worked with his dad for a long time”. In this instance the gift of mark making materials provided an opportunity for Yasir to express what is important to him, his baby brother, and to open up conversations between the practitioner and the whole family. The practitioner’s role was to share ideas and knowledge with families and to help to facilitate parents’ and carers’ involvement in supporting their child’s learning. The project has helped practitioners to understand and value mark making not just as a pre-curser to early writing but as a practice which supports the development of creative skills, with a value in and of itself. Mark making not only supports early writing through developing appropriate motor skills, but also opens up for the child the experience of being a visual communicator and interpreter; it helps children to develop an understanding that marks carry meaning and that also colour, line and form can be used to express ideas, thoughts and feelings. For artists, drawing is a fundamental skill which provides a foundation for all other visual art practices. The REAL approach encourages a valuing of literacy in its broadest sense and the environmental print and mark making strands in particular offer opportunities for children to develop a visual language and literacy encompassing not only words, but also an understanding of their context within symbols, shape, colour and design, and in relation to real life everyday experiences so that they are meaningful to the child and their family. The REAL approach has at its heart the ORIM framework which is designed to help early years practitioners hand over professional knowledge about how children learn early literacy skills as part of everyday life. ORIM highlights the ways in which families can provide opportunities for learning, recognition of children’s development, positive interaction and model. It also helps families to become actively involved in co-learning with their children by getting stuck in and doing activities together on a regular basis in everyday life. If you are thinking of using the REAL approach with families you work with visit www.real-online.group.shef.ac.uk to find out more. You can also read about the Making it REAL project 2015/2016 at www.ncb.org.uk/ecu/making-it-REAL. Email hwheeler@ncb.org.uk to receive the free Early Childhood Unit fortnightly bulletin to keep you informed about the latest national early years news, research and opportunities including opportunities to get involved with the Making it REAL project and training. Lucy Williams is the Principal Officer in the Early Childhood Unit at the National Children’s Bureau (NCB) and a visual artist.